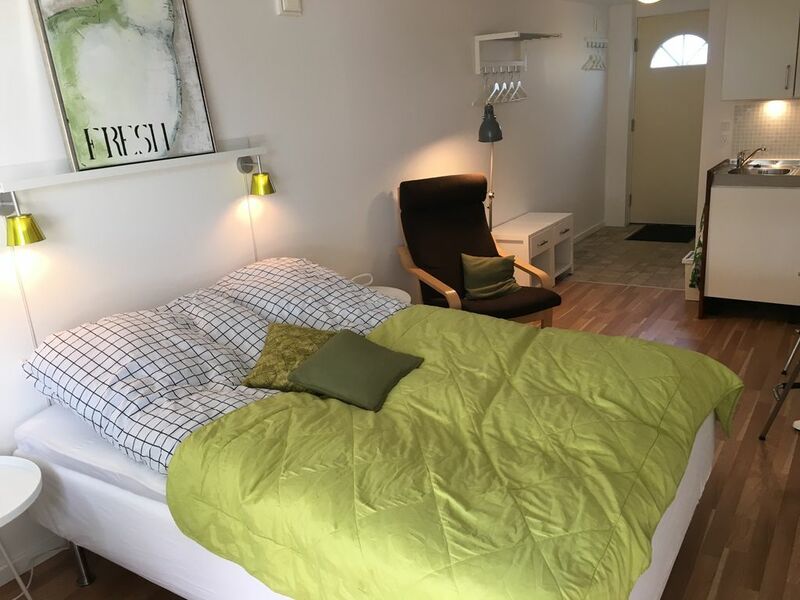 Beautiful apartment with own terrace in the lovely and green area only 20 minutes from Copenhagen square and Copenhagen airport. Very nice beach as well as small shopping center and train with in 10 min from the apartment. Enjoy a great or relaxing time in the city of all possibilities. It's a very cozy and chilled apartment, perfect to relax in after a long day of touristing or just a base to do what you want. Meget tæt på København og stadig er det et roligt sted omkring grønne områder, som vi anbefaler at tage en tur i - især omkring de lakes. Also great for running. You will have full access to the apartment, terrace and the lovely garden. Du kan alltid komme i kontakt med oss ​​i personlig eller telefon. We are also happy to give some tips for things to do, places to visit and where to get a good meal. They forgot to mention it is a 25 minute train ride each way from Copenhagen. Worse than that, they said it was a 7 minute walk from the train station. It was 1,5 k and 25 minutes each way, quite an exhausting trip with 2 pcs os luggage each and directions that were very meager. The unit was acceptable. Thank you for enjoying the apartment and that it was nice but sorry that you only give it a star. Regarding transportation, we are sorry that you thought it was far and did we knew that Dee was 78 years and Ron 80 years we had not recommended you to walk from the station. Good that you expressed that you enjoyed Copenhagen and otherwise had a good holiday. Hope you had a nice trip home. They say hygge cannot be defined. It is a state of mind. It is true. The apartment indeed put you in that relaxed homey state. It was everything we needed. Comfortable, clean and cozy. Close to the motorway and access to Copenhagen and major towns and attractions in Denmark. Our hosts were always extremely easy to communicate with and very accommodating. We wish them well and hope to return to their beautiful home in the future. Thank you so much for the sweet words and hope to see you again. Unser Feriendomizil war ein kleines gepflegtes Zimmer in Vallensbaek, in sehr ruhiger Lage. Unsere Vermieter wohnten direkt neben an und konnten uns so wertvolle Tipps geben bezüglich Einkauf, Restaurants und dem öffentlichen Nahverkehr, da wir mit der S-Bahn nach Kopenhagen gefahren sind. Das Zimmer verfügte über einen kleine Küchenzeile, so dass wir uns selber etwas zu Essen machen könnten. Außerdem war den Zimmer eine kleine Terrasse angeschlossen, auf der wir jeden Morgen gefrühstückt haben, mit Blick auf den Garten. Das Bad war mit einer Dusche ausgestattet. Das Zimmer war sehr schön eingerichtet und sehr sauber. Hinweis: das zimmer ist nur für 2 Personen geeignet. Resümee: Wir kommen gerne wieder. Snyggt inredd lägenhet med allt du behöver. Rent och snyggt och trevliga ägare. Fantastisk trädgård i anslutning till lägenheten. Sehr freundliche Vermieter, ruhige Nachbarschaft, gute Verkehrsanbindung, Supermarkt und Naherholungsgebiet ganz nah, gemütlich und gut ausgestattetes Zimmer... kurz gesagt: wir hatten alles, was wir brauchten und fühlten uns wohl. Vielen Dank für die süßen Worte, es war eine Freude, Sie als Gäste zu haben. wir waren zufrieden und haben uns wohlgefühlt die 2 Tage, die wir dort waren!